This week is children and nursery week. Big C is now almost a year and a half old which means that he is mobile and in to EVERYTHING!! His room now is the bare necessities also because my husband and I are very scared of SIDS. 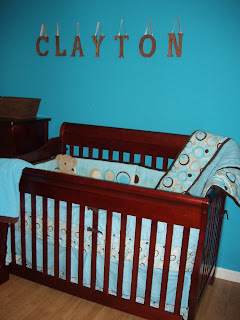 Here are pictures of his room, looking nice, BEFORE HE WAS BORN! This room was also done on a budget....the furniture came from Target and after a year and half, it has held together VERY nicely! It is in a cherry finish. The bedding all came from Wal Mart. 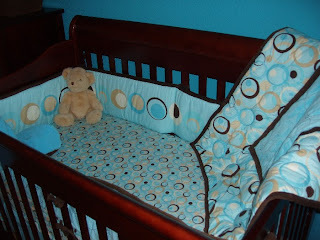 I fell in love with the colors chocolate brown with teal for a boy or pink for a girl....we had a boy...so teal it was! I got these letters from Hobby Lobby and stained them myself and added the ribbon to match. 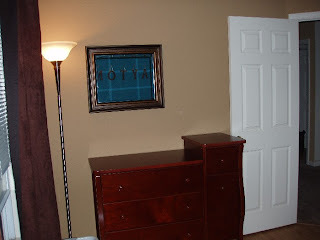 I love adding little touches like this to personalize a room. 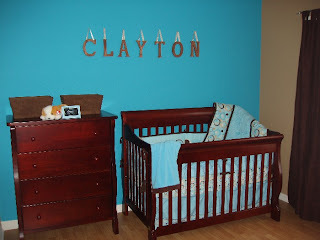 Curt painted the room while I was pregnant and he did a GREAT job! Big C's room is also the only room that has 'hard wood' laminate flooring. Here is the changing table...before we had the pad. 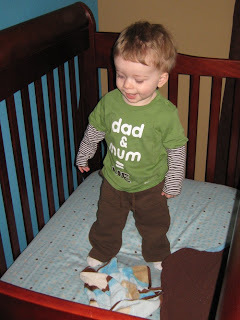 Now it holds everything that could imagine that you would need when changing a diaper or dressing a child. Here he is! The little man whom the room was created for, with lots of love. As you can see...he is a wild man! But we just LOVE him!!! Cute cute room! I love the colors on the wall, you did a great job! I absolutly love the color! So bright and fun! What a cute guy! That blue on the wall is awesome! Love it! Your bedding is so cute! I love the picture you have set as your "About Me" picture. Look at those eyelashes! Too cute. Great room. I love the blue and brown combo!